If the In an Alexandria Slave Market chapter in my book interested you, you can find more about the slaves in the War of 1812 in this review of Alan Taylor's The Internal Enemy. Captain Stark's Company represents an actual military unit stationed at Fort Madison (Louisiana Territory) during the years 1808-1813. Our group travels to various historic sites and reenactments throughout the U.S, according to its website. This is a fantastic website, with lots of history, information on uniforms, weapons and so forth. Highly recommended! Check out Brooks' Detachment of U.S. Marines and their re-enactments. Lt. Brooks Jr. left Washington D.C. in April 1813, with a small detachment of U.S. Marines. He was carrying orders to recruit men along the way, adding to his detachment of twelve men. Brooks found Army volunteers to fill his force and commanded the detachment from the U.S.S. Lawerence. during the Battle of Lake Erie, Lt. Brooks and four other Marines were killed. Twelve men of the 34 man detachment were wounded. Lt. Brooks was buried on the shore of Put-in-Bay, later to be moved to a resting place under the monument. He was posthumously awarded a silver medal by Congress. If you are interested in more details, contact Roger Heiple at cgbd86a@Prodigy.com. Check it out here. It's the battle that the United States won, led by Gen. Harrison. The great chief Tecumseh dies in this battle, which with the U.S. victory on Lake Erie (commanded by Oliver Hazzard Perry) swings control of the lake and the northern shore to the United States. Did the War of 1812 turn America into a world power? Here is an interesting podcast discussing a point that I raise in my own book. Ronald D. Utt, author of Ships of Oak, Guns of Iron is interviewed. COLONIAL MICHILIMACKINAC AND FORT MACKINAC ARE RANKED IN THE TOP 10 TOURIST ATTRACTIONS AND MACKINAW CITY THE NO. 1 TOURIST CITY BY FAMILYFUN MAGAZINE. 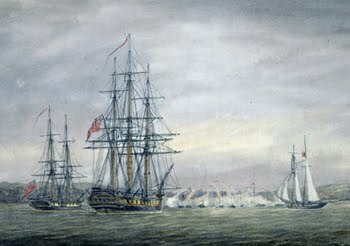 The capture of Fort Mackinac by British Captain Charles Roberts from Fort Saint Joseph, commemorated by the Canadians here, opens the historical novel, Madness: The War of 1812. Visit the St. Joseph Island Bicentennial Committee here for a list of events. Here's a great way to get a feel for actual events of the War of 1812. Matthew Allen, a graduating member of Xavier University’s class of 2013 and a political science major, created an entire website devoted to the Samuel Wordsworth poem, The Heroes of the Lake, celebrating the battles of Lake Erie and the Thames. Here is the link to the page. Sure morning streaks yon eastern cloud! Salutes the world another day! In bolder glow and broader streaks! It is, it is! the heavens grow bright! The glorious Lake reflects the glow! I love to contemplate the scene. At thy return, O morning! smile. The British had controlled the Chesapeake Bay since the beginning of the war. In an attempt to open the Bay, a flamboyant ex-privateer, Commodore Joshua Barney, assembled a rag-tag fleet of eighteen small gun boats, barges, and sloops and headed down the Bay in June of 1814. 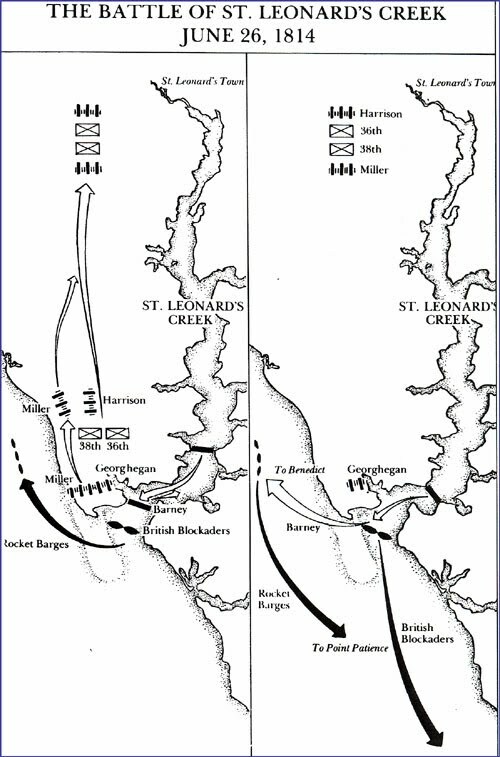 Barney's Chesapeake Flotilla clashed with the British on June 8 – 10 and again on June 26th in the Battle of St. Leonard Creek. The battle, which is the largest naval engagement in the history of Maryland, took place where the Patuxent River meets the mouth of St. Leonard Creek, right off the shore of JPPM. The naval engagement was supported on land by American Army, Marine, and militia units, including a gun battery which was located on JPPM property. Both the land units and the flotilla engaged the British, and hundreds of shots per hour were exchanged between the two forces. Archaeological evidence of the battle has been discovered on JPPM grounds in the form of cannonballs, musket shot and other military artifacts. Eventually the British retreated and Barney's fleet was able to escape from St. Leonard Creek. Bay area. I devote several chapters in my book to Barney. You can read more from the Museum's detailed piece at http://www.jefpat.org/1812war.html. While you are on the Museum's website, be sure to take in more war history at a museum exhibit called, "Farmers, Patriots and Traitors--Southern Maryland and the War of 1812." Also, here is a piece from the South Maryland News that describes the preparation for a re-enactment, including the making of uniforms for the re-enactors.